Although people actually asking permission to pet your dog from a safe distance is verrry slowwwly on the rise (people are still racing up to strange dogs, still getting bit, still causing trauma to the dog, still thinking dogs are public property…sigh…), there is one part, equally important, that continues to be missed. You ask to pet someone else’s dog. They say “yes, you may.” You walk right up to the dog, reach down and over the dog’s head with arm outstretched…and whammo! Instant dog bite. I had this happen at my business about a month ago: A stranger walked in to inquire about dog training. She saw the cute Pug across the room and without an invitation, made a beeline for the dog. Dog was scared and started growling. I instantly stepped in between and the stranger started to walk around me to get to the dog. I had to hold the stranger by the shoulders to stop her. I asked her what she was doing. Her response, “I want to pet the dog.” I told her to look at the dog, “does it look like that dog wants to be pet?” (in the meantime the dog is still growling). Her reply, “But I want to pet the dog.” I told her “It’s not about what YOU want, it’s about if the dog wants you to approach and pet.” She wasn’t all that happy about me physically blocking her from getting to the dog, but finally backed off. Even with the most innocent “ask and receive permission from the owner,” did you ever think to ASK the dog? Obviously we can’t “ask” the dog like we just did their owner, but if you’re observant and get out of your own internal wish to pet that dog come hell or high water, you can actually ask the dog. 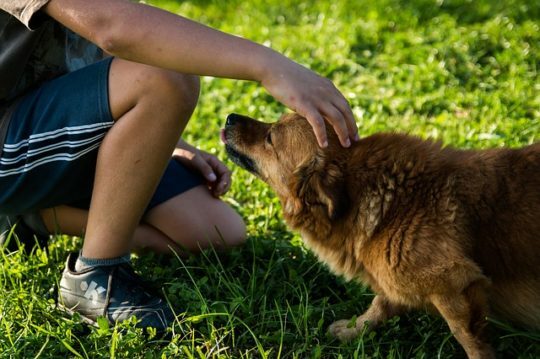 When I’m petting a strange dog (after getting permission, although I have to say, I rarely ask to pet someone else’s dog, preferring to admire from a distance – yes even with my own clients dogs), I do NOT just walk up to it and thrust my hand in it’s face. I squat down sideways, look away, yawn, lick my lips, keep my hands to myself, and wait….I watch out of the corner of my eye to see if and how the dog approaches. If the dog comes up nicely (no head down, tail not tucked, not too timidly, no overt calming signals, etc. ), I still wait…if the dog sniffs me, great. I still wait…(a dog sniffing you is NOT an invitation to pet it). If the dog inserts it’s face under my arm or hand with a typical “pet me” motion, then I do a few soft strokes on the chest and then take my hand away and wait…if the dog walks away, I let him move away – he’s allowed to have his own opinion about how and how much he’s willing to be touched. If the dog stays with me, I’ll pet a little more, then take my hand away again and wait… I give the dog an “out” so that if they want more petting, they can have it and if they don’t, I don’t pressure them to accept it. There have been some dogs that when I approach sideways, tell me from many feet away that I’m too close. I don’t pressure the dog – I simply walk away. After all, we all have our own comfort zone, where we will allow, or not allow certain people to come into or stay out of it. It’s only fair to respect dogs for the same thing. Take a look at the photo above. This dog isn’t all that thrilled about being pet on the head – you can see his head ducking and he’s licking his lips. If you aren’t aware of dog body language and you approach a dog inappropriately, be aware that you may be inviting a bite. Educate yourself! THE best resource is Turid Rugaas and her book and DVD on Calming Signals. (www.dogwise.com) Get them both and be sure to watch the DVD a minimum of 12 times. I’ve watched it over 2,000 times. No lie. Bookmark this article Asking the Owner is Great, But How About Asking the Dog?